The diary isn’t going to write itself. Nor is the breakfast going to cook itself. Nor are the bikes going to ride themselves. It was that kind of morning, quite a reversal of yesterday’s rush. Lollygagging seems to be an appropriate word for the morning, but it was a bit chilly and windy, so we weren’t highly motivated. 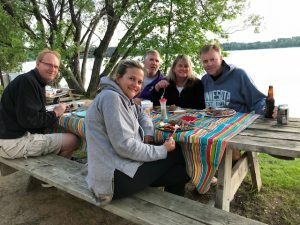 Eventually we started moving, and after our egg muffin sandwiches, we packed up the rigs and left Grand Rapids for Cass Lake and the Heartland Trail. Noon had come and gone by the time we rode our bikes south out of Cass Lake, so it was bound to be a long afternoon on the trail. 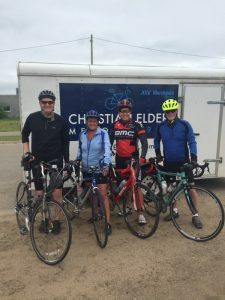 We have not been on this portion of the Heartland Trail for a number of years, so we rediscovered the pleasant scenery on the ride to Walker, where we found Doug, Ann and Sherry enjoying the warming day along the trail. After eating a quick lunch, we continued west on the trail with a nice tailwind toward Park Rapids. 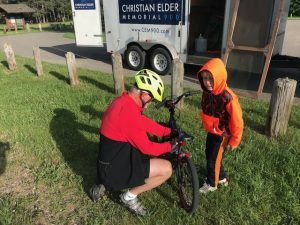 Dennis stopped in Akeley to check in at the campground, hoping to save time later. John, Kathy and Brian also stopped in Akeley to check out the sites downtown, specifically the Paul Bunyan statue and the Wood Tick Theatre. Dennis left Akeley thinking he was behind the other riders; in reality he was leading the group. Shortly outside of town he heard the familiar hiss of a tire losing air. The suspect repair job from a day earlier was coming back to haunt him, as the leak was in the same spot. 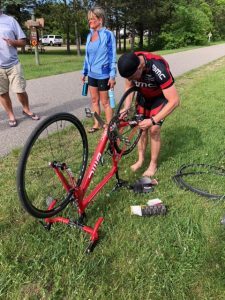 It was a slow leak, however, and he decided to continue riding on it as long as there was some amount of pressure in the tire. The eleven mile trek to the meeting point in Dorset with a flattening tire was a workout, but the tire held! John, Kathy and Brian rolled in a few minutes behind Dennis. John found a new tire, and Dennis quickly replaced the defective one and was ready to roll. We rode out of Dorset, into Park Rapids, and back into the wind to Dorset to complete our ride. Back in Dorset a young rider was hovering near the mother ship, sighing and grunting while bent over his bike seat. John asked if he needed help, and then he raised the seat for the boy. What a hero! The boy waved and headed off on the trail. It had been a long afternoon and was nearly 7:00 as we drove into our fabulous Akeley campground. We made quick work of the setup, and Doug and Ann grilled steaks and veggie kabobs for dinner. Afterwards, Ann whipped together a delicious crème brulee for dessert! We still had time for chatting around a campfire on our scenic lakefront before buttoning things up for the night.